Stuff Points: Earn 56 points when you buy this stuff. This 12-inch high fountain will look great on any table, shelf, desk or dresser. It is the perfect choice for adding the soothing sounds of splashing water to any room. Water flows from the top of the fountain, over the rocks and into the pool below. The natural looking river rocks shimmer as a gentle stream of water flows over them. Rustic styling, natural coloring, and the soothing sounds created make this unit a peaceful zen experience. Clear your mind as this unique fountain slowly melts away your tensions. 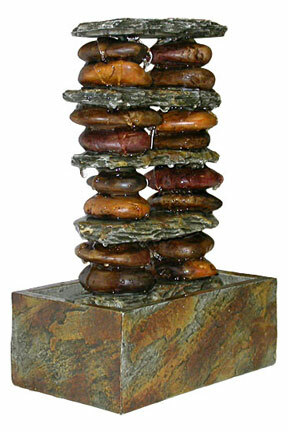 Dimensions (L x W x H) 8" x 5" x 12"
The Stacked Rocks Table Top Fountain - Perfect for any indoor space. This uniquely styled fountain will enhance the decor of any home or office. Lightweight materials and a small footprint make it easy to place it almost anywhere. Order Yours Today!